"X" marks the spot for quality and performance. For nearly 100 years, Super-X Ammunition has delivered the exceptional quality and outstanding performance shooters demand. For plinking and small-game hunting, you can't beat it. Winchester Super-X, .22 Magnum, JHP, 40 Grain, 1,000 Rounds is rated 4.9 out of 5 by 7. Rated 5 out of 5 by tom 81 from Fair price, Have not used ammo yet but should be good! Rated 5 out of 5 by DANIEL from This is a nice all-around choice for .22 magnum shooting. I do a lot of squirrel hunting here in Pennsylvania and this bullet works well in my over-and-under. This past season was my best so far! 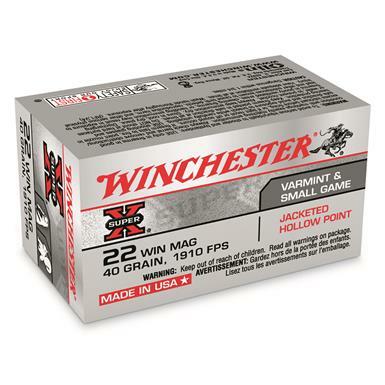 Rated 5 out of 5 by MARK A from good ammo!great price!!! Muzzle Energy (ft./lb. ): 100 ft.-lbs.